Another recipe from my lovely cousin in law! I happened to be defrosting a big box of chicken thighs, had been thinking about experimenting with the container of miso I recently purchased, and voila! Her surprise recipe email arrived in my inbox on the same day! The chicken turned out tasty, though I might want to adjust the amount of the sesame seeds or take it out all together to let the miso taste shine. 1. In a small bowl, combine seasonings ingredients and mix well. 2. 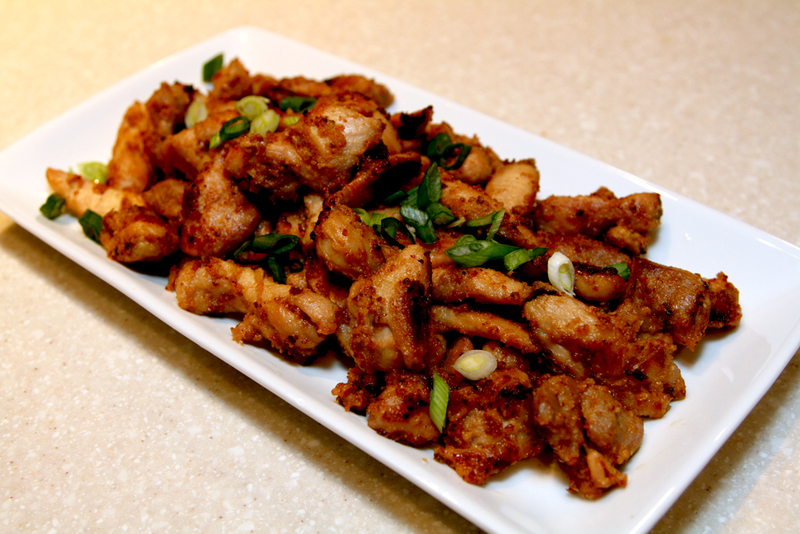 In a non-stick frying pan, heat sesame oil over medium high heat and cook chicken until both sides are nicely browned. If chicken is not cooked yet, cover with a lid and reduce heat to medium-low. 3. When the chicken is cooked through, add seasonings and cook until most sauce is evaporated. 4. Transfer to a plate and garnish with green onions.